Who doesn't love dices and sailing! This is a game about sailing or sinking, trading or robbing, alliance or treason, at your call. Brainstorm of this game is fairly easy, or, almost doesn't exist. I had the idea of a sailing game. I love the feeling of sailing across the sea and conquering all kinds of dangers along the way. This idea itself is solid, "automatically themed" and can generate many interesting gameplay mechanics, so I felt confident with it and decided to go with it. So, the initial idea is: make a game centered around sailing and dices. Then I came up with the first rule set. This is a sailing & trading & battling game happens on the sea. The first game includes: a map, cards, ship tokens, account books, and two dices. 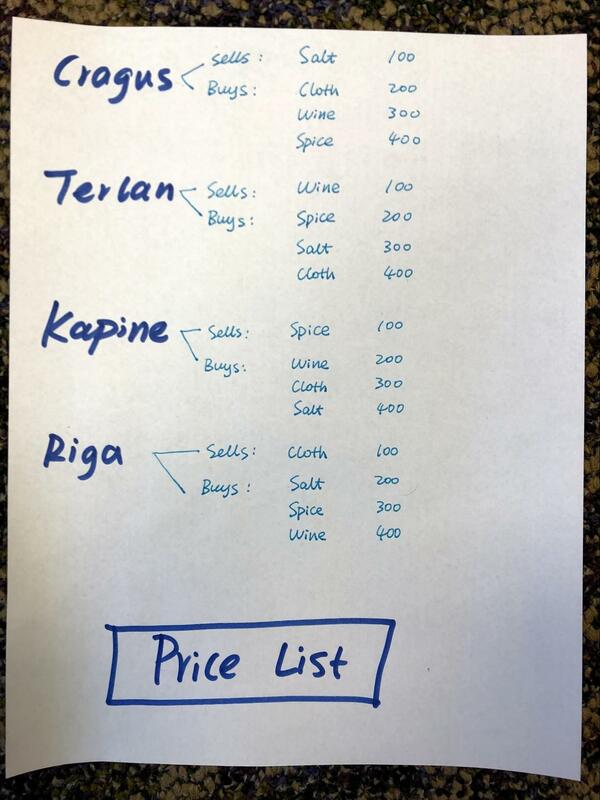 In the beginning, each player choose his/her ship and starting harbor, and have the chance to buy some goods. Everyone's starting fund is 2,000. Everyone also gets an account book to mark down transactions. Nanda & Flola: they are neutral cities, randomly sell goods. Choose one as the tailwind dice, another as dead wind dice. Movement point is the difference between them. If they equal to each other, the player cannot move, but can draw a card. Pirate ship: At the end of each round, two players each roll one dice. The first dice determines the number of steps the pirate ship can move, the second dice determines the direction: 1-North, and rotate clockwise (2-Northeast, etc). If pirate ship gets adjacent to a player ship, that player ship sink. A ship can trade with port when get adjacent to the port or stops in the port. Playtesters: Yidi himself testing in his head. The pirate ship looks like a good idea, but it's hard to find a convenient and clean way to move it, and it's hard to decide an appropriate penalty. In the first place, I add the pirate ship to increase interactions between players, but this seems like not the best way. Erhan (ETC 1st year) and I played the game. Erhan was confused with most rules, even I explained them in our native language. So I think it's a good idea to make more clarifications for rules. So, this iteration focuses on clarification of rules. The player need to roll a number that's larger than 9 to get out. The player can choose one of the tile adjacent to the whirl. And his/her turn ends. A ship can use partial movement points to stop in a port. When a ship stops in a port, the ship can trade with the port. 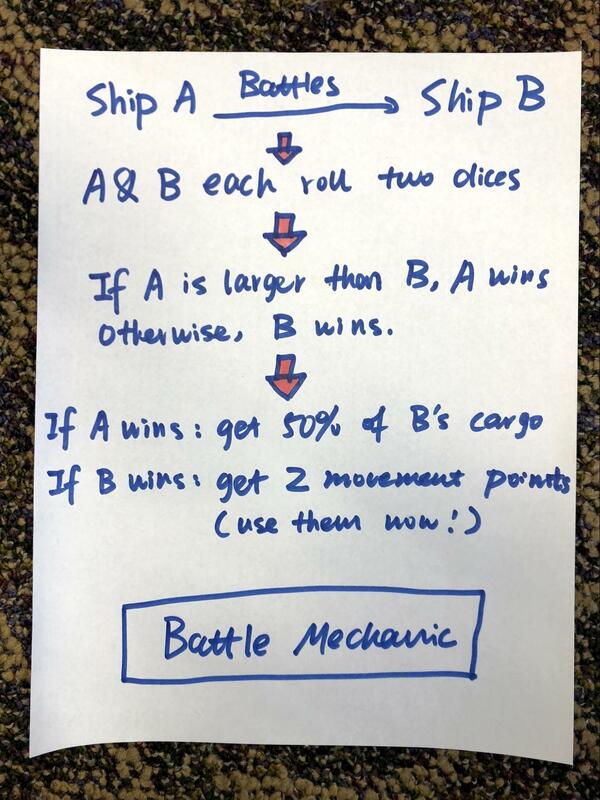 After trading, the ship can use remaining movement points. After dice roll and movement, draw one card. Lotus (ETC 1st year), Xuejun (ETC 1st year), Erhan (ETC 1st year) and I played the game. People love the unusual dice roll, and they enjoyed the game! And the potential problem listed in iteration 1 seems to be not a problem at all. They loved the rich interations between players, the mechanics of the whirld, the event and action cards, and the rich system. However, the numerical system of this version is totally messed up! For example, Xuejun got a "full sail" cards, which increases her movement speed by 100% during one turn, and she rolled a 6 and a 1, which gives her a total of 5 * 2 = 10 movement points! She sailed across the sea and got an easy victory. Beside that, there is still many confusions about the rules. One final thing, Erhan seems to not like the improv cards - he always discard them. This is not a good signal. I also did some modifications to the cards. One major change is to the "full sail" cards, I changed the extra movement point from 100% to 50%. The reason why I have this card is to give the player the chance to move faster while still taking some risk. Because this card can only be played before dice roll, so its effectiveness still depend on the dice roll. If the player rolls a 2 + 1, the card only gives 1 extra movement points. If the player rolls a 6 + 1, the card gives 3 extra movement points. 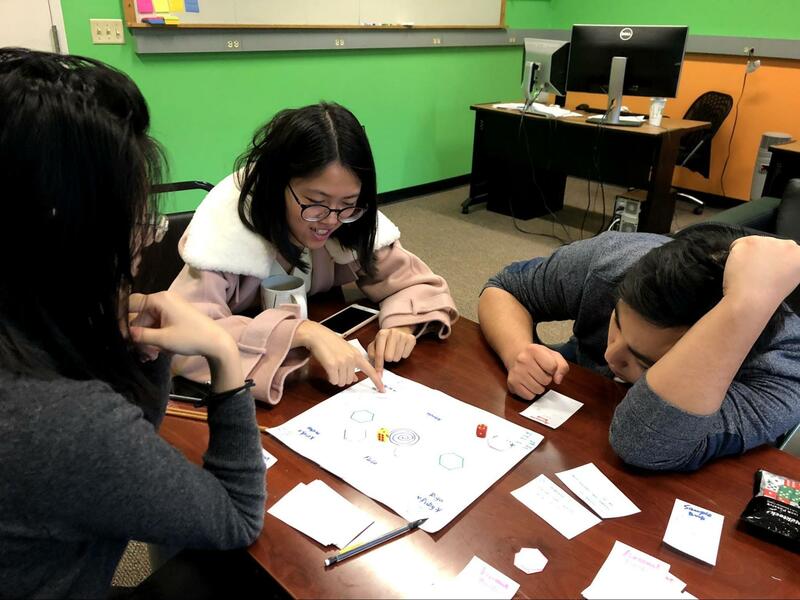 Tommy (a CS major from GCS), Euna (ETC 1st year), SorryIForgotHisNameA (ETC 2nd year), and SorryIForgotHisNameB (a business major) played this game during the class. They thought the game was surely fun! But the numercial system is totally broken, and the improv cards can be either awkward or interesting, all depending on the people. They gave many nice suggestions, such as making improv cards compulsory, limiting the cargo capacity. They also felt it's so hard to get out of the whirl, and the neutral ports are not really helpful. Amukta (ECE Junior), Zohaib (HCI Master), and I played the game. This playtesting reveals the math problems in this game!!! It's almost impossible to calculate the numbers after drawing one inflation cards (which increases all prices by 20%). Also, no one want to write on the ship. Also, the goods availability, and prices, chance too frequently. It's hard for players to make strategic planning. They also give me the suggestion to use tokens, but I would need a LOT of them, which makes it not so feasible. If people don't want to write the goods on their ship, and I don't want the ship to look dull, why not give them the chance to name their ships!! It must feel good to sail a ship with a name on it. It's a feel of ownership, and it helps to get players immersed. Then, all trading information can be written on the account book. I changed the "inflation" cards. Right now, they only change the buy prices at all ports without introducing too much decimals. I played the new version with myself. This time I focuses on cards. 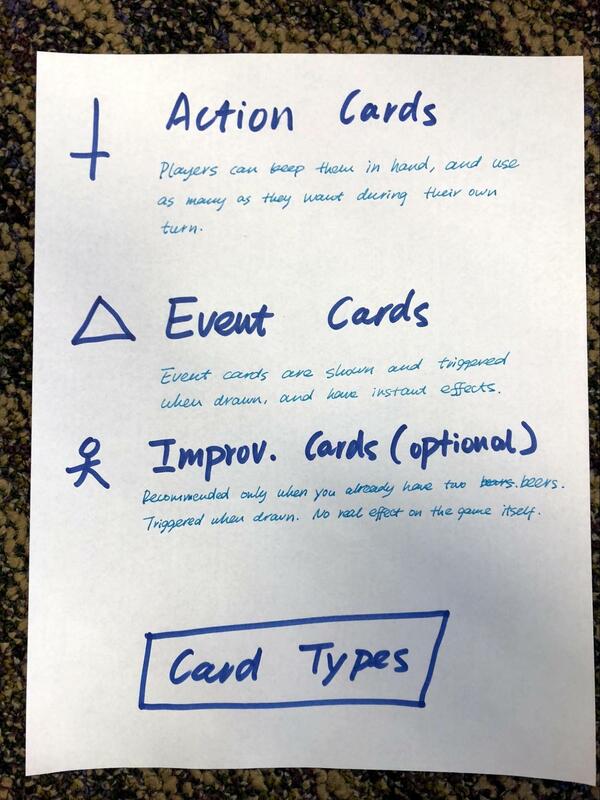 For improv cards: make them an optional module that the player can choose whether to include them or not. It would be a nice idea to include them after 2 beers. Also, I changed all of them to involve all players, rather than selecting one player and embarrase him/her. For the storm card, I introduced dice roll to it. Player will only lose goods if rolls smaller than 7. This makes the game more random and more exciting! I added more movement intervention cards. Also, one new card: "Tail wind" - get two movement points this turn. Also a card on combat: "Superior strategy" - instantly win a combat. Shan (ETC 1st year), Srujani (ETC 1st year), and I played the game. Some confusion about the attack mechanics. Other than that, the playtest went well. And they seem to enjoy writing on the account book. The new map provides less information. I added goods beside ports to show what they sell. Attack costs no movement points, and one can only attack once in one turn. I had a final playthrough with myself before class. And I feel like the neutral ports is kind annoying - they are not predictable and really change a lot. However, if by any chance a player can buy some good from them, it's very OP! I want to find a way to deal with them. 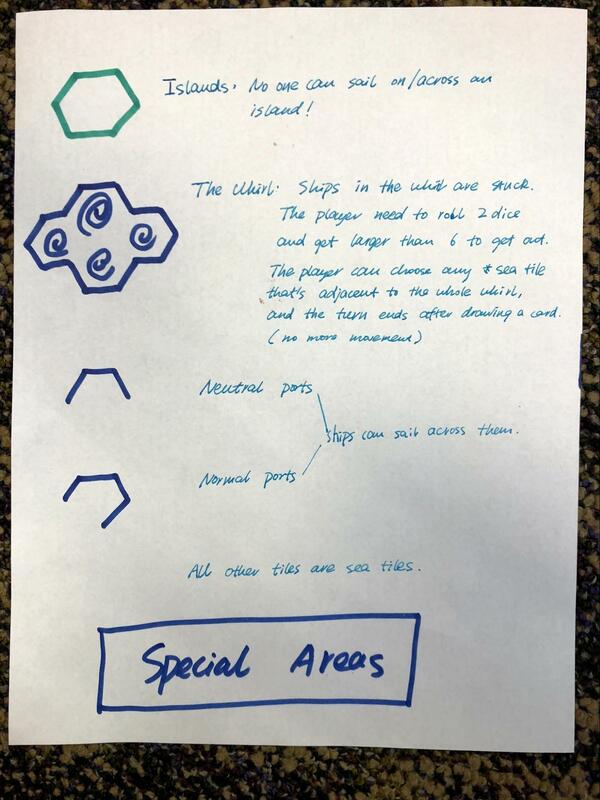 For descriptions of map elements, cards, and battle mechanics, see the attached sheets in the package. 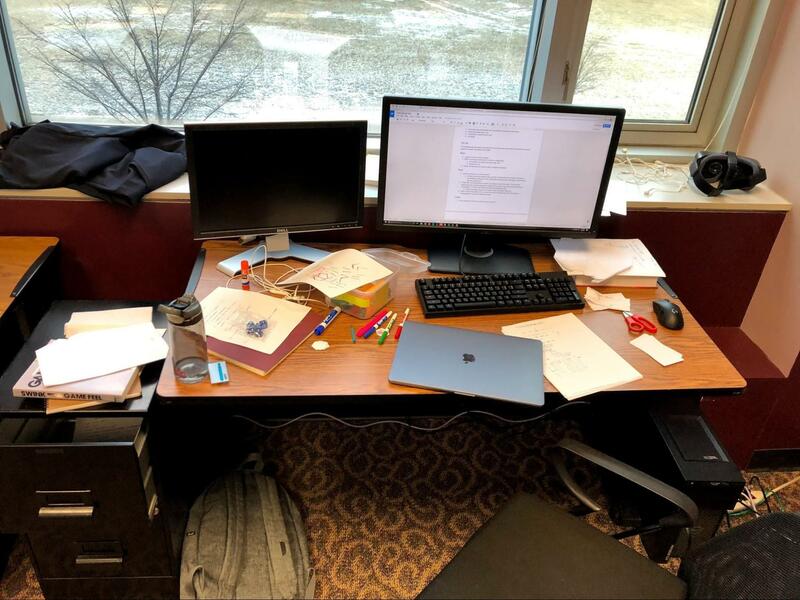 Place the map on a table. Each player gets to pick a ship, name the ship, and write the name on it. Each player gets an account book, that matches the ship's color. Each player gets 2,000 golds as starting fund. Each player rolls two dices, whoever largest gets to move first. Whoever gets 20,000 golds first wins! Roll two dices. The movement is the different between two dices. However, if the two dice are identical, like two 5s, the movement point will be 5 instead of 0. The player can move as he/she wants. During/before/after movement, player can trade with ports. Player can only trade with ports when sitting inside them. Note: each player can only attack once in her/his turn. And attacking doesn't cost movement points. Then the turn ends. The player draws a card. Move on to the next player's turn. The player can use as many action cards during his/her turn as he/she wants. If a ship is in the whirld, or in a port, other ships cannot attack it. For rules on map areas and cards, see attached sheets in the package. One more thing: Remember to draw a card at the end of your turn.